Home of the original "Sunset Depot" web site. Click on the photo of the station you want to visit! web site. 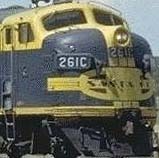 I HIGHLY recommend the TTM site for superb, extensive information on all south Texas railroads. Geographically located near the center of southewest Texas, San Antonio was at one time the crossroads for several different railroads: The Missouri Pacific (MOPAC), the Southern Pacific whose "Sunset Route" from Los Angeles made for many a well-known person to visit the city-- Greta Garbo, Lillian Gish and Al Capone to name just a few; the Texas & Pacific Railway and the Missouri Kansas Texas "KATY" Railway. The San Antonio & Fredricksburg Railroad provided passenger and lumber service to the hill country just north of San Antonio. The rails heading south out of Fredricksburg were taken up some years later and now the line only extends to the Camp Bullis military range. The line is now owned by the UP which runs daily rock trains out of an immense quarry near the Fiesta Texas theme park. On part of the adandoned line, close to the town of Welfare, there is an old tunnel that now serves as a residence for bats. In the fall, about dusk, people gather at a spot on the mountain above the tunnel to watch the bats come out for food. The cloud of bats is so large that it routinely shows up on doppler radar signals. Posted here are photo sets of the three major San Antonio stations. The famous MKT Station is gone, but the other two, the "MOPAC" station and the Sunset Station have been refurbished and are still standing.